In March (and a little earlier than I budgeted for) I collected a new 12" Apple PowerBook, delivered with two 15" PowerBooks and a PowerPC to the Mahidol University International College (MUIC) out at Salaya. I walked across campus from the Engineering Faculty partly to save a second delivery trip, but really because I could hardly wait to get my paws on it. Once home, I started it up, had a look and reached for the install disks. I would not expect anyone else to do this, but I am fanatical about the idea that the personal in PC means "personal". When I bought my last PC -- a 386, no less -- I had problems convincing the seller that I really did want "just DoS"; then I reinstalled. With the PowerBoook, I made a custom install: no un-needed languages; no IE; no trial version of MS Office; but I made sure X11 was installed so that I could run Unix software. The process took about 30 minutes then came the user setup. Brad Koehn writes that Apple in its wisdom by default gives no password to many accounts (like the all-powerful "Root"): no matter what password a hacker tries, they cannot guess Root's password unless you explicitly give Root a password (MacInTouch). I also have a few ideas about preserving the security on my machines and decided to create three accounts: an administration account; a user account for day-to-day use; and a games account, with limited privileges, allowing access only to specified programs. While updating and installing software (and while switching accounts on the go) I was prompted numberless times for the passwords. That is as it should be; the alternative genders risk: there is no telling what might get on there. During the setup I omitted online registration (that came later) and the Setup Assistant. This is only useful if you want a cloned system, but it will copy across all user settings, applications and documents later if wanted. I prefer working from scratch. When the installation was finished, I inserted the Ethernet cable and was online instantly. An advantage of going with an ADSL modem/router was that I also have a home network and can link the two machines, transferring data easily. I was dubious about this when I first bought the eMac but having tried the Mac mini -- and linked the pair -- I changed my mind (this laptop has a different purpose from my desktop machine). I can print from the laptop to the HP 920C attached to the eMac by USB -- OSX recognised this with no configuration needed -- and with "sharing" in iTunes I can play music installed only on the eMac. iPhoto also has a setting to allow sharing of images. The only problems I met were with the password for an e-mail account, and the inability to make Rendezvous -- linking with no setup -- work. The former was an error in entering the password (if you do not type it correctly, it will not work, eh? ); while the latter was resolved with a restart. My major software additions were NeoOfficeJ (a development of OpenOffice that does not need X11), Gimp as a Photoshop substitute, and iWork. This is a new Apple release combining Keynote 2 (presentations); and Pages, a new program for creating documents: from newsletters to brochures. I have had this on test and will be reviewing it soon. When everything was installed (applications and documents) just over 10GB of the 60GB disk was used. 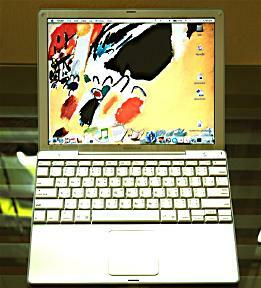 The 12" PowerBooks first appeared in January 2003 and I wanted one immediately. When I was riding motorcycles I considered the iBook with its tougher white polycarbonate plastic (much loved by students -- there are several iBooks at MUIC and at Bangkok University) but fell for the PowerBook, especially with its recent upgrade to 1.5GHz. Other factors were the larger hard disk, and the now-standard 512MB of RAM which Apple should supply as standard for all machines. When cash-flow improves I will put that up to 768MB. Standard too on these new Macs is Airport (Broadband wireless) and Bluetooth. Pairing of my Ericsson T630 was easy and I used iSync to update the Address Book and the calendar software (iCal). I have not yet tried Airport. The computer came, as usual, with much software including the iLife 05 suite, which I can confirm is now part of the install disks (earlier machines had a separate disk). 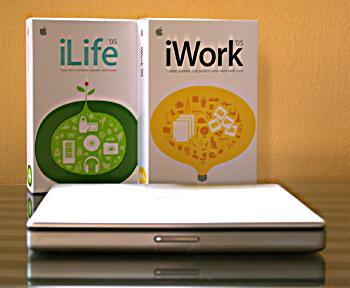 As I acquired iLife 05 along with the copy of iWork, the eMac will have its upgrade in the next day or two. We three teachers made the purchases using an Apple education Distributor: EITS Solution. The MUIC publicity department had the PowerPC and a 22" Cinema Display. Prices are slightly less than retail. I was buying mine over three months. The prices (not the credit) are also available for students and proof is needed. EITS is part of Ingram Micro (Thailand). At the time I wrote the original article, there was only a corporate website: a link is now available to EITS Solution here. Contact is via e-mail to pornpen@eits.co.th or songpon@eits.co.th who can send the latest information directly. 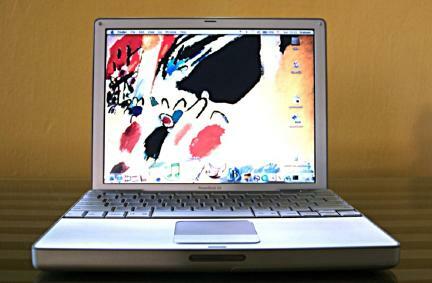 Note: For the second part of comments on the PowerBook 12", I have posted a follow up here.